Work smarter, anywhere, with Microsoft hosted email for business, Get business email, calendar, and contacts on your PC, phone, and web browser. Get Business Class email from anywhere, on any device, at anytime. It’s easier than ever to provide your users with the business email they need to stay productive. Automatic patching eliminates the time and effort of maintaining your system. Microsoft Hosted Exchange provide users with anywhere access to email, calendar, and contacts on all major browsers and across devices. Integration with Outlook means they’ll enjoy a rich, familiar email experience with offline access. Why Choose Microsoft Hosted Exchange? All the advantages of on-site collaboration, whilst reducing overall costs. Outstanding protection from our award winning security solution. Customers are 9x more likely to choose a business with a professional email address. Always have your latest emails and appointments at your fingertips! Upgrade to 50 GB Mailboxes for storage for your email, contacts and shared calendar. Looking for more information on our UK hosted Microsoft Exchange Email solutions. Microsoft Hosted Exchange is the world’s most popular and versatile business email platform. It is a cloud-based email messaging and collaboration service designed to help you and your business communicate securely and efficiently. Emails are hosted and fully-maintained at our UK secure data centres. 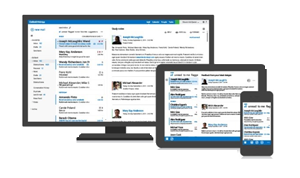 Email, calendars, tasks and contacts are synced through Microsoft Outlook, and can be accessed on your mobile device. All emails are automatically scanned by our anti-virus software and our service is backed up by our 99% Service Level Agreement. Emails are hosted and fully-maintained at our UK secure data centres which are monitored 24 hours a day. We have two separate power suppliers as well as generators which ensure business continuity for you and your business in the event of a power outage and other untoward disasters. We only offer the latest version of Microsoft Hosted Exchange (2013). Yes. We will use your existing domain to set up your mailboxes. We can set up a domain name on your behalf if you currently do not have one, just ask a member of our award winning team if you require assistance. Does Hosted Exchange support mobile / wireless devices? Yes. In addition to syncing all your mail, calendar, contacts and tasks to your PC, we offer “mobile push and sync” technology, which syncs all your data with various mobile or wireless devices. Microsoft Hosted Exchange supports most operating systems including iPhone, Google Android, Windows phone and iPad.